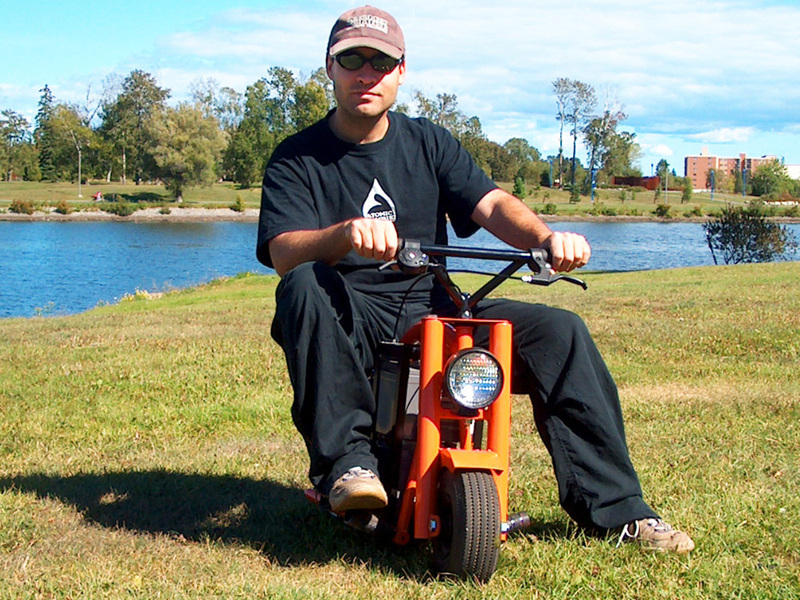 Build Your Own DIY Electric MiniBike. This easy to build DIY electric power minibike is a wickedly fun battery powered minibike in a very small package. With enough torque to spin up the dirt and conquer any hill, this little electric rocket will give you an hour or more of nonstop fun for only a few pennies per battery charge. 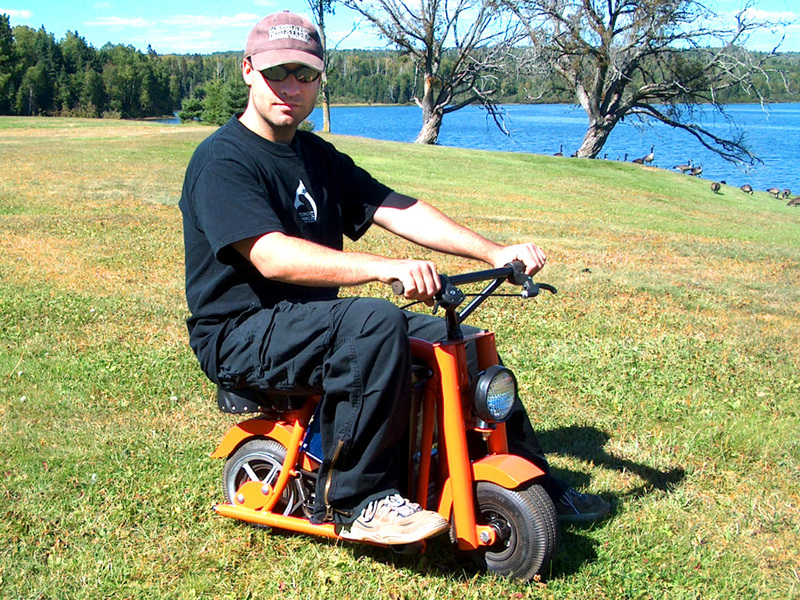 Our detailed DIY electric minibike plan will show you how to create your own fun recreational vehicle that can be used anywhere due to its absolutely silent operation. Now, you can have a blast without disturbing the peace! Using only hardware store components and a basic electric DC motor, this easy to build and fun to ride electric minibike will run for hours on a single charge. Making no sound at all, you can ride this little power house in places where gas powered minibikes are not allowed. Sparky utilizes a high quality DC electric motor and controller, and can be tailored for run time, top speed, or maximal torque. Imagine doing the city speed limit on a tiny electric minibike that is small enough to fit in a suitcase, or how about pulling your buddy up a massive hill on a skateboard without even slowing down - Sparky can easily pull it off! 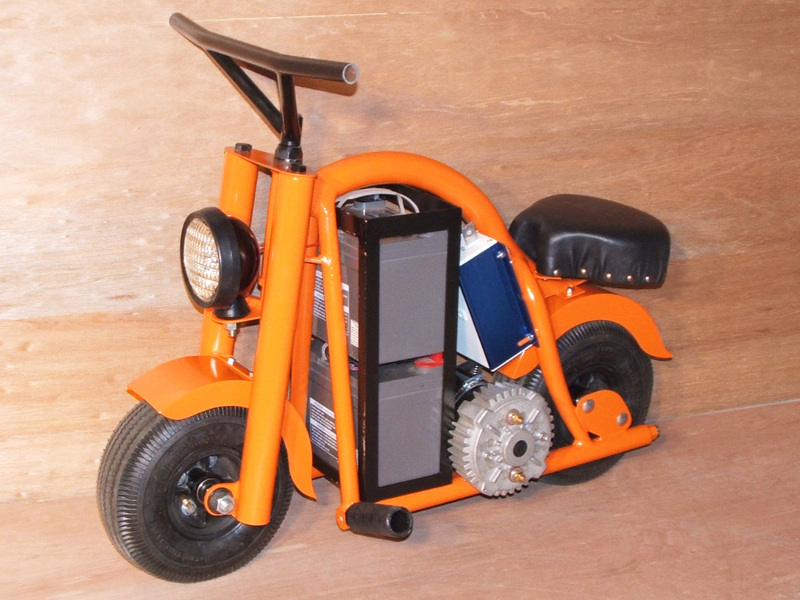 This plan teaches you how to build a small electric minibike, and you are free to choose your own motor type. Cheap department store electric pocket bikes and gas minibikes have nothing on this extremely durable and mighty electric minibike, and you get to build it yourself. The best things in life are not made in factories! Fast and Stealthy. Ride it Anywhere. 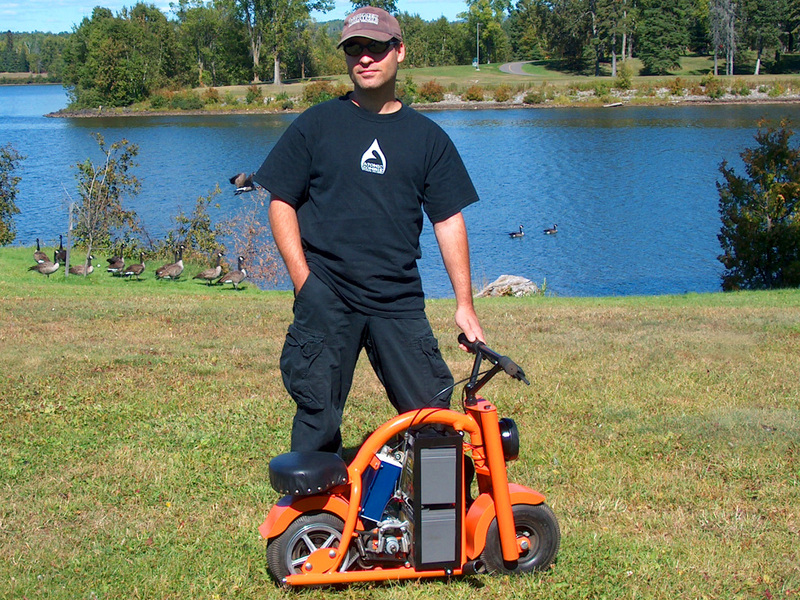 Amaze your friends as you take off like a rocket without making any sound at all on this tiny electric minibike. Because Sparky makes very little sound, you will be able to enjoy riding in places that are restrictive to those annoying gas powered pocket bikes and minibikes. The only emission that Sparky will make is the dirt spun up by the back wheel and refueling is as simple as plugging in the AC cord on the battery charger to any available AC outlet. The transmission is made using hardware store pulleys, and is efficient and quiet. Pnumatic wheels can be purchased at your local hardware store or online for a minimal investment. You can even salvage many of the parts from old washing machines or dryers. Build it on a Budget. The smooth variable throttle offers great control, and you can govern the top speed so that young stunt pilots can also enjoy the electric minibike. Sparky is small and light enough to be placed in any car trunk, and uses parts and components that are easily available on the internet. 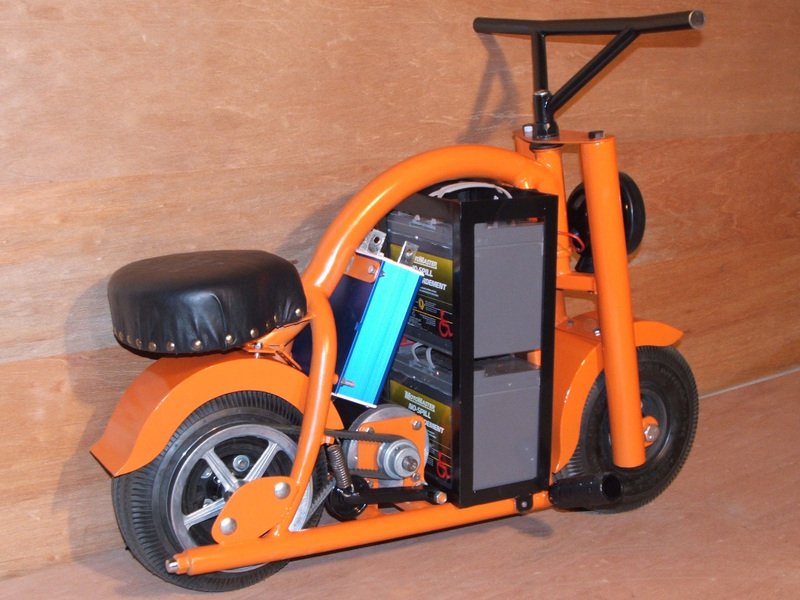 Batteries are standard department store gel cells and will last for many years, making this electric minibike less expensive to operate than a gas powered bike of similar power. Atomic Zombie’s DIY electric pocket bike plan will show you how to choose the components needed in order to make your own electric fun machine on a budget. Many of the steering components can also be salvaged from an old bicycle frame. 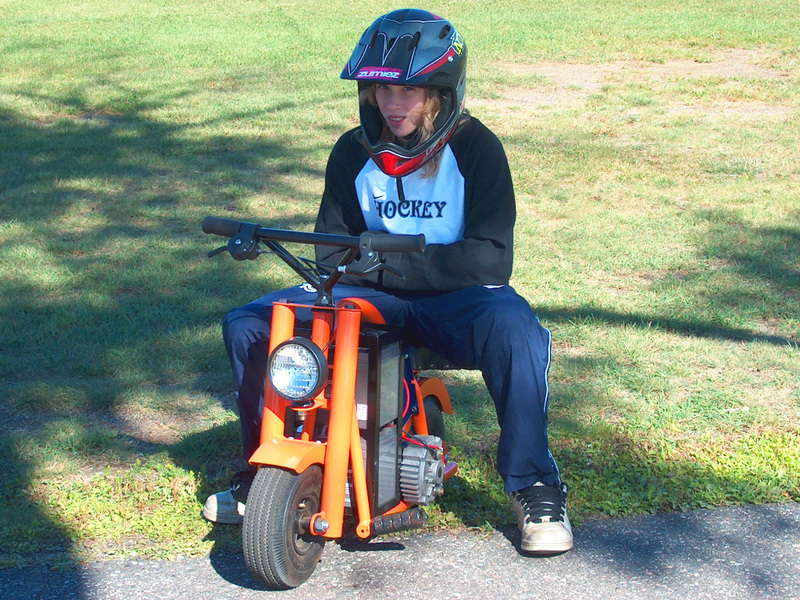 Our DIY electric minibike plan leaves plenty of room for customization, so you can build your own motorized pocket bike of any size, shape or specification. You will be able to enjoy a ride around the campsite or zip down the urban trails without drawing unwanted attention to yourself, running on completely silent and stealthy electric power. Even with a smaller electric motor, Sparky will offer acceleration that only a full sized gas powered dirt bike has, so you can blast around on or off the road. The frame can be made out of hardware store conduit tubing, and even the curved section is just a factory bent elbow. Build a seat using plywood, foam and cover it yourself. Every part of this project is easy enough for anyone to do. Build it to Your Own Specs. 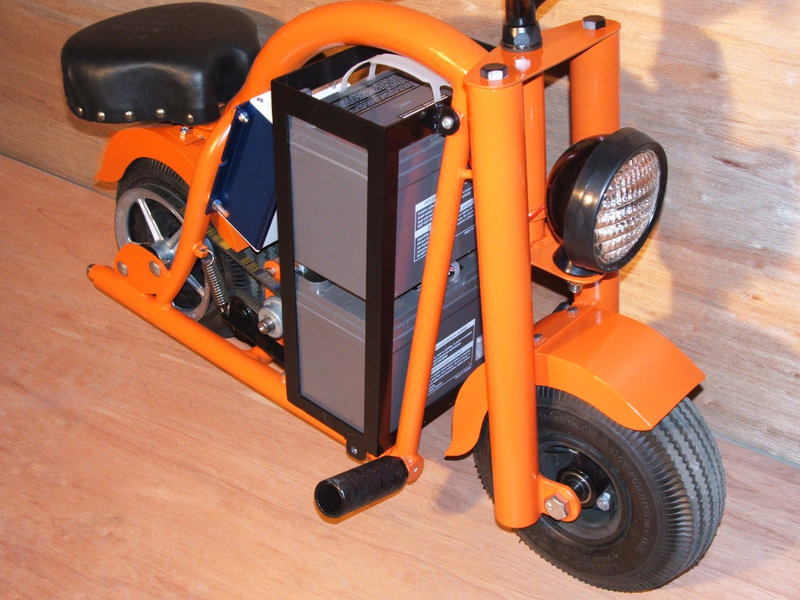 You will only need basic tools and materials along with the electric motor and controller in order to build your own DIY electric minibike from our easy to follow plans. You can choose from several motor and controller configurations to suit your budget and build an electric pocket bike with the specifications you want. The frame is made from mild steel tubing or hardware store electrical conduit, and most of the transmission uses standard hardware available at any appliance or hardware store. This fun to build DIY electric minibike is easy to customize. Create your own fenders from sheet metal, and add your own accessories for a totally unique look. Make your bike look like a mini Harely or a high performnace street bike. Silent Belt Drive and Massive Acceleration. 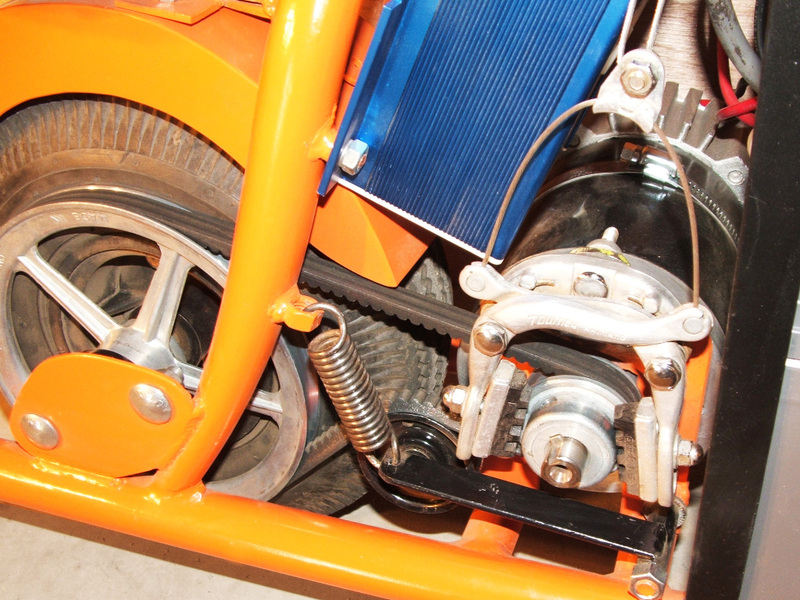 You cab use sprockets, pulleys, or gears to make your DIY minibike transmission. Our plans are all about recycling your junk so you can build on a budget. Braking is accomplished by letting off the throttle so the motor controller can slow you down. For extra braking power, a bicycle caliper can also be installed. This same design can be used to make a much larger minibike as well, just scale everything up to suit your wheels and tires. The large battery back is easily removable as well, so you can keep a spare bank charging for all day riding. Just plug in your bike when you are done, and it will charge from your AC outlet. You can use standard gel batteries or lithium batteries for even more power. Fly With The Power of The Electron! There is nothing more fun than the intense acceleration of an absolutely silent running electric minibike. Spin up the dirt, pull an extended wheelie, blast up that massive hill, or just enjoy a nice quite trip through a wilderness trail on your own DIY electric minibike. If you have been looking for the perfect recreational vehicle for your next camping trip or for riding where gas bikes are prohibited, then Atomic Zombie’s Sparky electric minibike plan is the perfect answer. Don't let the small size of this bike fool you - it can be built to keep up with city traffic! Even a one horsepower DC electric motor will move an adult up to the speed limit with ease, so you can gear your bike for speed or for massive climbing power and acceleration.